Geisha are traditional Japanese female entertainers who act as hostesses and whose skills include performing various arts such as classical music, dance, games and conversation, mainly to entertain male customers. Modern geishas nowadays pursue going to school first until they reach teenagers’ stage then decide then on if they wanted to train or not. 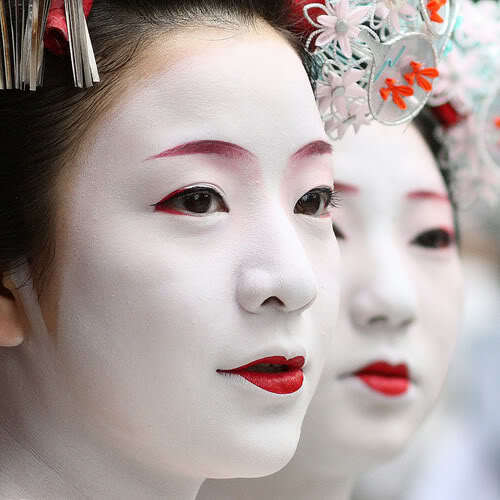 During their performances, it is a crucial part for geishas to put on a heavy make-up which is said to be an influence from the T’ang Dynasty in China. This can actually take a very long time if you’re not an expert on it. There are key things you should remember when applying the Geisha makeup. The wax is important so that the white foundation that you will apply all over the face, neck and nape will stick or last. The red dots applied at the corner ends of both eyes are key to the look. The red lipstick will prove to be a handy cosmetic since it can be used for the dots (just don’t forget to pat and blend). Finally, the lip geisha makeup is meant to illustrate a small mouth because I learned that, by custom, Japanese men find them attractive and sensual. 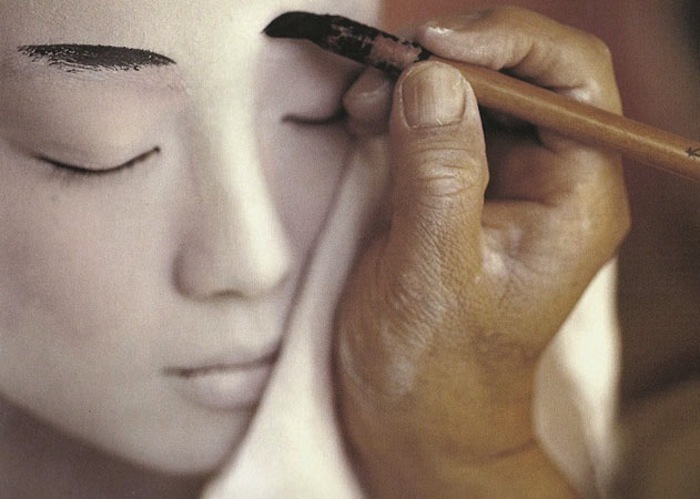 A Geisha makeup consists of unnatural ivory white skin, and defined eyebrows, lips, and eyes. To get this unnatural ivory white skin, you can use white face paint to cover your face. Another way to create this super white foundation is to mix cold cream with cornstarch. Water can be added into this concoction if needed for consistency. After you have perfected your white foundation evenly over your face, make sure that you have even covered your eyebrows with the white foundation that you have decided to use. After everything is covered, you must shade in your eyebrows so that they are more defined. Using an eyebrow pencil, draw a straight, defined brow over your own eyebrow, being careful to not create a curve. You can choose to shade in your eyebrows with pink or red eye shadow or any color that you feel comfortable with. After you are finished with your eyebrows, make sure you apply liquid eyeliner but only on the top of your eyelids. Do not wear mascara, as Geisha’s eyelashes are not typically defined. However, if you feel the need to, you can. Paint your lips a bright color such as a very bright red or pink. To get a brighter effect on your lips, cover your lips first with concealer and the white cornstarch mixture. Make sure you draw your lips in a bow – lip fashion. 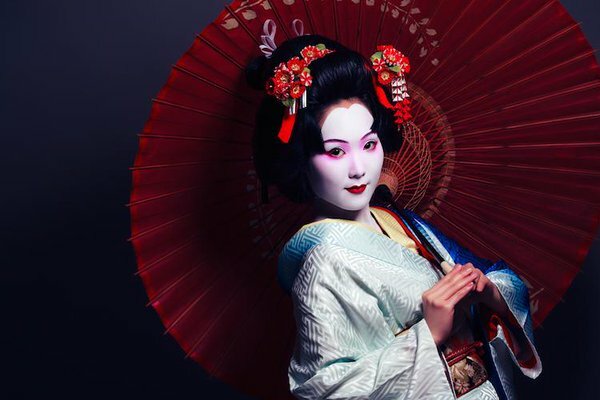 How about a really good demonstration and then a step-by-step for achieving a realistic Geisha look? The artist begins by applying a wax substance to the face as a setter for the next step, which will be a white rice powder paste. Rice powder is mixed with water to get the proper application. In the past, lead-based whites were used. When applying rice powder paste, she begins by defining the nape of the neck. Usually in a V or W shape. Excess moisture is removed with a sponge. 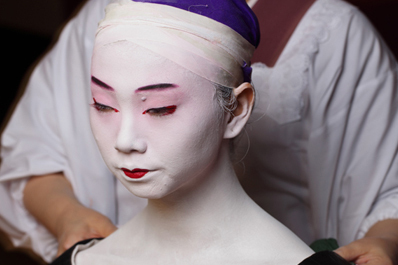 The small space between the white geisha makeup base and the hairline is meant to give the illusion of a mask. The super fine texture would probably be better for smoothing out brush strokes. Red is added to the corner of the eyes and blended inwards. Then, the lash line is defined with modern liquid eyeliner. Pay lots of attention to your make-up. A Geisha makeup must be flawless. 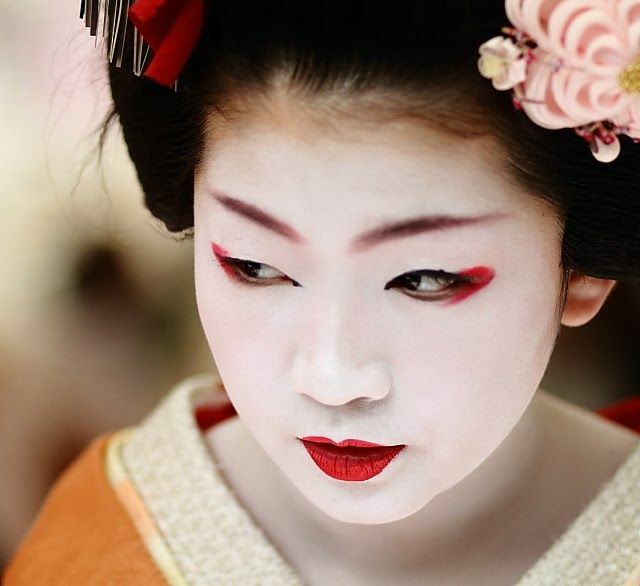 Geisha apply a wax-like substance called “bintsuke-abura” to their face, neck and chest. This will help your foundation to stay on. Take a pot of white face powder, and mix a good amount with water to create a sort of paste. Apply this with a brush to your face and neck, as you would a foundation. You may need to use several layers, as your face, chest and neck must be completely white. However, it is important you leave a some bare skin around your hairline. If you do so, it will give you the appearance of wearing a mask even more so. It is especially important at the back of the neck, as this area is very sexual in Japan (the same way we in the Western culture view legs). If you wish, you may leave two or three v-shape lines on the back of your neck bare. Finally, take a large sponge and dab it over all areas that have the paste applied to them. This will take up any excess moisture and leave you with stunning, white skin. Take a black eyebrow pencil and draw in your eyebrow shape. You will be able to see what this should look like from the pictures to your left – they are soft and full. You will also notice they are tinged with red, so use a red eyebrow pencil, also. But remember – there is only a hint or outline of a red. Using a brush, and some red liquid eyeliner, apply a layer of red upon your top eyelid. Start this line in the middle of the lid and flare it out slightly as you reach the end. Then, take a black liquid liner and, using a thinner brush, stroke it all the way along your top lid, as one would normally in western makeup. You may wish to apply a small amount of red eyeshadow. If you do wish to do this, try to blend it into several different shades as you move across the lid. Using a simple black eyeliner pencil, apply a soft layer to your bottom lids. Finally, the lips. 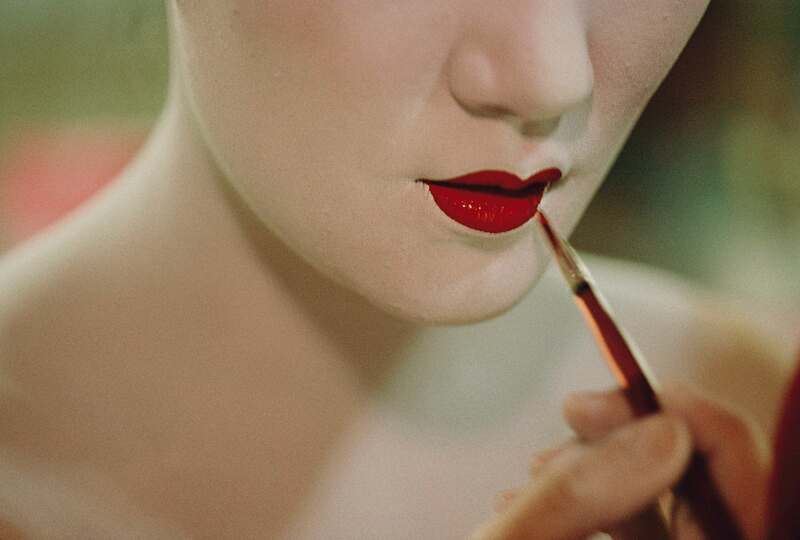 Use a thin lip brush and a vivid red lipstick. First, using a lip liner of the same red as your lipstick, make an outline of the lip shape you wish for. Geisha rarely paint their whole lips – instead, paint only a small, pouty shape upon them. The rest of your lips should be covered in your white foundation. When you have made the shape, colour inside and over the line until the area is completely covered in a thick, glossy red.